Persistence Market Research offer 8-year forecast for the global Yeast market between 2018 and 2026, with the primary objective to offer insights on the advancements in the Yeast market- which is expected to register a CAGR of 5.4% during the projected period. At the very beginning, the study gives an overview of the global yeast market and further analysis various micro and macro factors along with trends, drivers, restraints, value forecasts, and investment opportunities in the yeast market over the forecast period. A section of the report also highlights yeast demand, region-wise. It provides a market outlook for the projected period and discusses key regional trends contributing to growth of the Yeast market globally, as well as analyses the degree to which drivers are influencing the market globally. Key regions assessed in this report include North America, Latin America, Europe, APAC, and MEA. In the final section of the report, a competitive landscape has been included to provide report audiences with a dashboard view. Key categories of providers covered in the report are Yeast suppliers and key players. Detailed profiles of the providers are also included in the scope of the report to evaluate their long-term and short-term strategies, key offerings and recent developments in the Yeast market. Key players in the global Yeast market includes Alltech Inc., Chr Hansen A/S, Kerry Group Plc, Lesaffre Group, Ohly, Royal DSM N.V, Lallemand Inc., AB Mauri, Angel Yeast Co., Novous International, Laffort SA, Liber Gmbh, Oriental Yeast Co., ltd, Renaissance BioScience Corp, Imperial Yeast, DCL Yeast Ltd, Agrano GmbH & Co. KG, Leiber GmbH, UNIFERM GmbH & Co. KG. and Bintani among others. PMR utilizes robust methodology and approach to arrive at market size and related projections. The research methodology for this report is based on 3 dimensional model. In addition, we leverage our existing pool of information, paid database and other valid information sources available in public domain. Data is collected from secondary sources including company annual reports, association publications, industry presentations, white papers, and company press releases apart from these we leverage our paid database subscriptions and industry magazines to collect market information and developments in exhaustive manner. After which a detailed questionnaire and discussion guide is formulated to initiate primary research with key industry players- aimed at collecting key insights, growth perspectives, prevalent market trends and quantitative insights including market size and competition developments of the global yeast market. These insights are then studies closely to arrive at precise consumption of yeast, globally. 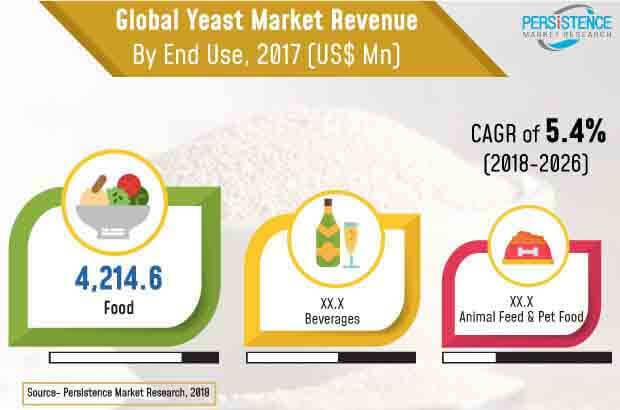 Yeast - a commonly used fermenting agent that helps bread rise and alcohol ferment has witnessed increased adoption in the recent years owing to the elevating demand from the end-user sectors such as food and beverages, significantly contributing to the global yeast market. In terms of value, the global yeast market is anticipated to expand at a value CAGR of 5.4% during the forecast period 2018-2026. Rising awareness of health benefits associated with the consumption of fermented food that contains microorganisms such as bacteria and yeast - that use the nutrients in the food as an energy source, resulting in the transformation of food, containing organic acids, can be considered as one of the most prominent factors driving the demand for yeast, globally. As indicated by regional analysis, Europe will remain the most dominating market for bakery products and around 60% of the flour produced in the U.K. is used in the manufacturing of bread products, in turn, fueling the global yeast market. Over the last decade, the food industry as a whole has witnessed a rise in the consumption of fermented food products such as yogurt, pickles, and sauces and, some traditional Asian foods such as Kimchi and Kempeh. Owing to its fermenting property, yeast has been used on a large scale for fermentation in the production of these foods, eventually driving the demand for yeast in the global market. According to experts, bakery industry has been using yeast as an ingredient and not as a food additive, till recently. However, to raise the hygiene and nutrition bar, food regulatory authorities across the globe have approved yeast as an ingredient in baked other foods. This move helped bakery products gain momentum, resulting in increased consumption of bakery products and bread. Additionally, studies have indicated increased consumption of alcoholic beverages around the world. This increase rate of consumption of alcohol has directly influenced the demand for yeast, which is the key ingredient used in the production of a majority of alcoholic beverages such as beer, wine, and whiskey. Different types of yeasts including ale yeast and lager yeast are used for fermentation in the alcohol production process, to provide the right proportion of texture and flavor to the alcohol. Vegan, non-GMO, organic, and gluten-free are the new green badges of food formulations. Studies have revealed a steady shift away from traditional dairy products towards plant-based alternatives, due to growing health concerns. This global trend toward nutritionally beneficial choices is anticipated to be the real winner in the bakery products segment. Owing to this rising demand for organic products, organic yeast is anticipated to gain traction compared to conventional yeast, which is expected to account for a considerable value share in the global yeast market.